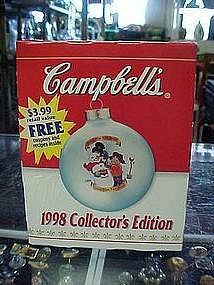 This glass 1998 Collector's Edition Christmas ornament has been retired. 3" diameter, and is perfect. Probably never taken from the box. This one comes in the original box with recipes. Box is a little smashed on one edge. Happy Holidays from Campbells.